The smokey flavour of the maple syrup goes beautifully with the toasted coconut, flavouring the entire cake with a lovely nutty scent. Enjoy this cake warm or cold, it lasts well if kept in the fridge and goes especially well with tropical flavours; grilled mango, passionfruit pulp, crushed berries or cherries. In a large mixing bowl, beat the butter, sugar, maple syrup, cloves and nutmeg until very light and fluffy. Add the salt and vanilla then add the eggs one at a time, beating well. Once the sugar is completely dissolved, add the milk and then add the flour and baking powder all at once and fold through, combine well ensuring there are no lumps. The batter should be ribbony, but not too thick. If the batter is dense, add a splash of additional milk. Lastly add the toasted shredded coconut, folding it through. Line a loaf tin and add a sprinkling of raw coconut into the base of the tin, then pour the cake batter into the tin. 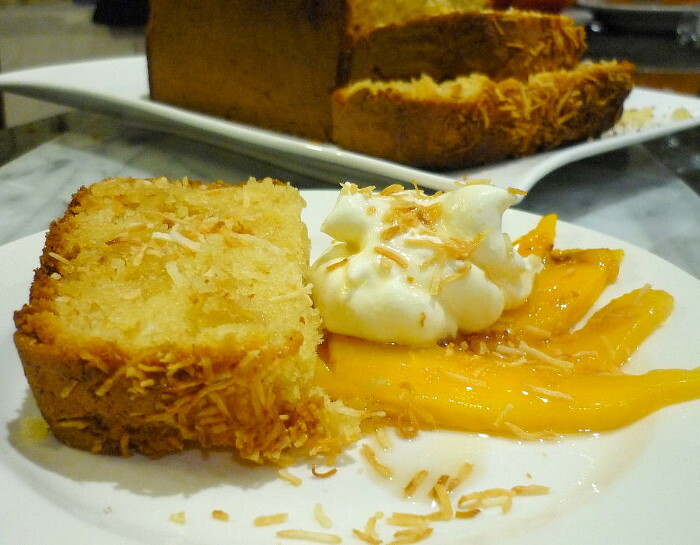 Sprinkle a little extra coconut on the top of the cake, and a tiny drizzle of maple syrup. Bake in the middle shelf of the oven for 35-40 minutes, or until the cake starts to pull away from the sides of the tin and is a deep golden colour. Serve with grilled mango, a dollop of yoghurt (or cream) and a drizzle of maple syrup. Lovely if served slightly warmed.